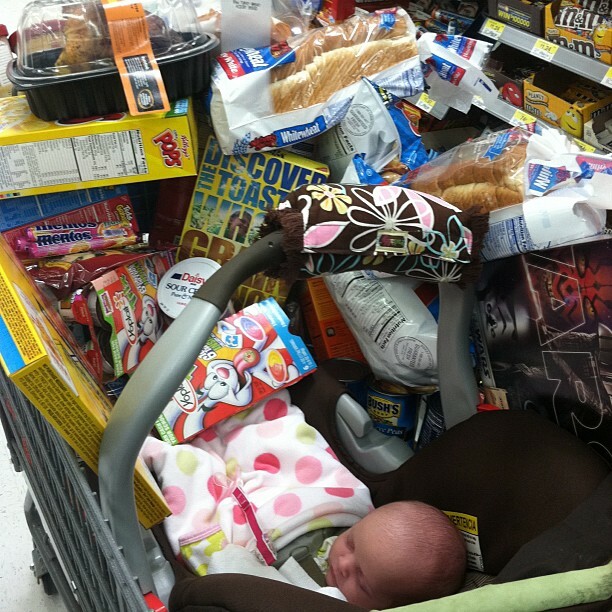 You may have seen (via my Twitter feed ------>) that I took Amelia grocery shopping with me at Wal-Mart on Monday. 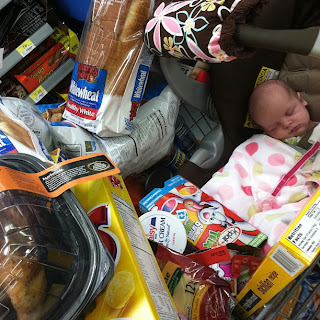 Unfortunately, Wal-Mart's shopping carts don't have a safe place for an infant seat to go -- except in the main compartment where all your groceries need to go. Sort of. If only she'd been able to use her hands, I could have gotten the soft drinks that were on the list. 1. I was wearing my pedometer, and while I was there I walked 2,000 steps. Roughly 1,100 of those were due to the fact that they've remodeled since I was last there, and nothing was where I expected it to be. I did a LOT of backtracking. 1a. Why are peanut butter and jelly now on the Cookie aisle? They used to be in Condiments. AS THEY SHOULD BE. 2. 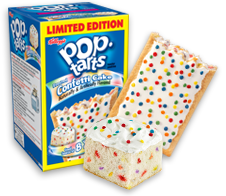 The more "festive" flavors of Pop-Tarts (such as Confetti Cake) now have "To" and "From" stamped on one of the side panels of their boxes. WOW. Birthday present shopping just got a LOT easier. So. Shopping at Wal-Mart isn't what I would call "shopping locally." I prefer to shop locally whenever I can, though, and Birmingham is a GREAT place to do that. I can't tell you how many little independent shops we have, where I LOVE to shop for unique gifts. At lunch recently, Wade at Magic City Post introduced me to ShopBirmingham.com, where Birmingham metro-area businesses have banded together to offer menus, gift certificates, products, services, general contact information and more, all in one place. The site makes it easy for those of us who live here to support the local economy, and convenient for us to find the products and services available from shopkeepers all over the metro area. 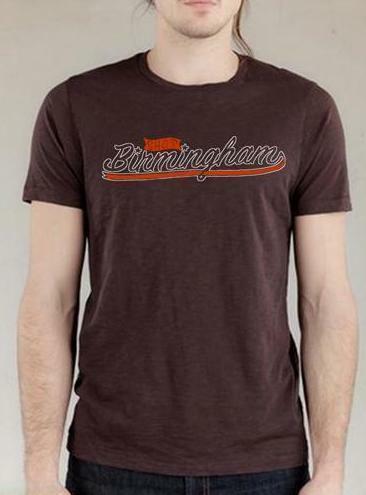 He also gave me a really cool, retro-looking ShopBirmingham T-shirt to give away! (I got one, too, and I LOVE it.) It's chocolate brown in a size Large, and the cotton is super-soft. Leave a comment on this post and you'll be entered to win; simple as that! Indoctrinating Amelia early into the art of shopping!!! Way to go Mom!!! Love soft t-shirts!!! i live in Mt.Airy, Ga but I grew up in Tuscaloosa so a Birmingham shirt would make a great prize! I have never seen that kind of pop tarts before.. I'm astonished!!! Going to Wal-Mart right now to get some! Katherine, I've been away from the blogging world for a while and ventured back today. So glad to see that you and Amelia are both safe at home now! Enjoy these precious days, as you know they go so fast :) All the best! I would like you to build me one of those confetti pop tart cake boxes, please. She looks so cute surrounded by groceries. I don't live in b-ham, but I would wear that shirt. I have a thing for brown t-shirts. I could never get into the Pop-Tart thing. I bought the Toaster Strudels once they came out. If they really wanted the tarts, I would get them occasionally. The box offered as much taste as the items themselves. I would make up a couple of batches of sausage balls, bake, & put them in the freezer. Then, for breakfast, pop a few of them in the microwave and wah-la breakfast. I love my ergo carriers and moby wrap for shopping trips! I have never popped the carseat out with this baby. I can not stand that thing! I love the brown t-shirt. Amelia is adorable! I couldn't live without my baby Bjorn when my kids were little. i wish i neeevvver saw those poptarts! i need them now! Poor baby! Lol. I'm cracking up. Glad to see you are out and about getting the groceries after your recent health crisis. Amelia is a beauty! I can't resist a contest. :-) and I love your Amelia pics w the grocery cart. Can't wait to catch up w you both- very soon!